London: Hurst and Co., 2012. 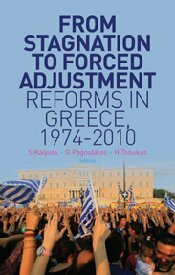 In From Stagnation to Forced Adjustment: Reforms in Greece, 1974-2010, the authors provide a timely and scholarly assessment of political and economic reform in Greece since it emerged from dictatorship in 1974. Written as an edited book by scholars in economics, international relations, management, public administration, and political science, the authors explain why the overall reform record of Greece is disappointing, despite its adoption into the European Union (EU) and a political structure seemingly open and sympathetic to adopting reform [defined as "a substantive change of policy choices in a public policy sector, including the founding of new institutions and the changing of policy directions” (14)]. The authors explain this reform failure in two ways: reviewing the post-1974 reforms in the six policy areas of the economy, education, pensions, health care, foreign policy, and public administration and “identifying theoretical explanations that could account for the outcome the reforms” (2). The authors conclude that while Greece has “managed to graduate from authoritarianism and relative underdevelopment to a prosperous mature democracy in the heart of Europe” (7), the political and economic crisis that has engulfed the nation after 2010 showed clearly that Greece has suffered from extensive reform stagnation and failure. Before reviewing the book, some background is needed to lay the groundwork for why political and economic reform is necessary in Greece (and by extension other Western countries, though this is outside the scope of the reviewed book). Readers who are familiar with the financial crisis of the past few years may profit from the brief review, but this section is not needed to understand the remainder of the book review. The aftermath of the worldwide financial crisis of 2008-09 has been ugly for the two largest economic regions in the world, the EU and the United States (US). As a whole, the EU is experiencing economic contraction and worsening unemployment rates. The economic gap between ‘core’ and ‘peripheral’ European countries has expanded, yields on sovereign debt in European ‘peripheral’ countries remains dangerously high, and recent national elections have shown the increasing political mistrust between politicians and voters. In the US, after a severe but temporary economic contraction in late 2008 and early 2009, economic growth is still sluggish and below its historical trend. Additionally, while Standard & Poor’s downgraded the credit rating of US federal government in August 2011 because of a rising debt-to-GDP level, political actors have shown little political appetite to confront or control the problem. The deteriorating economic climate has forced many Western countries to either devaluate their currency or seek external financing. Iceland devalued their currency (the krona) in 2008 to offset losses in their banking system. Ireland accepted a European Union – International Monetary Fund (EU-IMF) bailout in November 2010 in an effort to alleviate its sovereign debt crisis. Portugal accepted an EU-IMF bailout in May 2011 to help stabilize its public finances. Spain received an EU-IMF bailout in June 2012 to help recapitalize its banking system, which was devastated by loan losses due to the precipitous fall in real estate prices. Cyprus is currently negotiating (as of press) an EU-IMF bailout, which includes a controversial one-time tax of bank deposits, to recapitalize its banking system after they suffered severe losses when Greece’s sovereign debt was restructured. Even Italy, while so far avoiding a bailout, adopted a technocratic government in November 2011 that adopted austerity policies to manage its ballooning sovereign debt (the February 2013 elections have cast this progress into doubt). As serious as the fiscal situations are in the above countries, the first EU-IMF bailout following the 2007-09 financial crisis occurred in Greece and set the stage for the following bailouts. In the fall of 2009, the center-right New Democracy party called for a national election after its failure to pass promised reforms in its attempt to cope with a deteriorating economic environment and decades of inefficiency throughout the Greek economy. The newly elected center-left Panhellenic Socialist Movement (PASOK) government revealed to the international community that Greece’s deficit-to-GDP level was significantly higher than the previously reported six percent. Additionally, after PASOK failed to adopt considerable fiscal reforms to lower the burgeoning budget deficits, international lenders froze Greece out of the international capital markets, making it impossible for Greece to meet its financial obligations. Faced with the possibility of default and unable to devalue its currency like Iceland, in April of 2010 Greece’s government officially asked for international assistance from the EU and the IMF so it could cover its yearly financial needs. [1a> However, the €110 billion bailout was soon exhausted as special interests opposed the additional reform Greece needed to reconstruct its fiscal house and international credit markets were still wary of lending additional money, since the fiscal situation in other European countries had sharply deteriorated since the initial Greek bailout. Therefore, in July 2011, Greece once again requested a bailout from the EU-IMF of €109 billion. Since then, Greece’s economy is still struggling and reform is lacking. Only time will reveal if Greece will need future monetary assistance. The financial crisis has brought to the forefront the pressing need for countries to seriously reconsider their fiscal affairs. Stagnant economic growth and mounting sovereign debt levels, mostly driven by social welfare policies (chiefly retirement and medical programs) enacted when economic growth was more robust, continue to strain national budgets. As the number of beneficiaries increases and the number of workers decreases, the situation is untenable in the long-run and reform is needed. Perhaps the country with the greatest need for reform (at the very least it is the most pressing) is Greece, having already obtained two international bailouts. Unfortunately, interest groups that have benefitted from the status quo have resisted change. This book provides a historical focus of the reform process in Greece and helps to frame why economy wide reform has been so difficult. After an introductory chapter framing the book’s objective, analyzing why the reform record of Greece is poor, the book is divided into three parts. The first part (chapters 2 through 5) provides the theoretical explanation for Greece’s reform record. The second part (chapters 6 through 11) analyzes case studies of reform in the six policy areas mentioned above. The final part considers the 2010 sovereign debt crisis and integrates it into the preceding discussion of reform failure. This review will provide a brief description of each chapter. The second chapter, written by Dimitri A. Sotiropoulus, argues that “paradoxically the Greek political system today seems suited to foster reform but in practice fails to do so” (10). Greece’s political system should be receptive to reform because of its strong executive branch, a legislative body often dominated by single-party government majorities, a relatively subservient bureaucracy, trade unions that are financially dependent on the central government, and thirty years of pressure from the EU to reform. However, Sotiropoulus argues that Greece has suffered from reform failure because of “insurmountable obstacles at the stage of the implementation of reform” (10). Sotiropoulus describes reform failure in two ways: “when an attempt to change a policy proves unsuccessful” and when “a government makes no attempt to tackle a problem for a long time” (15). Using this definition, the author rejects traditionally accepted arguments explaining Greek reform failure (reform is politically costly, the hierarchy of Greek political parties is unreceptive to reform, and well connected interest groups prevent reform) because they consider too narrow a definition of reform failure. The author also criticizes large-scale theories such as historical institutionalism, rational choice, and political economy approaches because they “often fail to focus on the particular constraints and obstacles to substantive policy change” (27-28). Sotiropoulus spends the remainder of the chapter explaining the obstacles of reform, both before and after a reform is passed. The author argues that reform failure can take five forms: reforms are abandoned before they reach parliament, rejected by parliament, accepted by parliament but never implemented, accepted by parliament but quickly reversed, or are accepted by parliament and implemented by policymakers but are ineffective. Even if a reform is passed by parliament, the author details nine additional ways reform may fail: judicial rejection, a change in the institutions tasked with implementing the reform, rejections of the reform by supranational institutions, bureaucratic obstruction, lack of skilled administrators implementing the reform, lack of funding, resistance by social interest groups, resistance by economic interest groups, and indifference on the part of prospective reform users. Sotiropoulus concludes that “explanations of reform failure are more differentiated and more complex than is often thought” (28). In chapter three, Kevin Featherstone and Dimitris Papadimitriou place “the study of Greece’s reform process within the contemporary literature on comparative political economy” to “examine the structural conditions within the domestic system that limit reform” (32). The three strands of literature considered are neo-corporatism, varieties of capitalism, and welfare regimes. For each strand of literature, Featherstone and Papadimitriou explain the framework of the theories and then adapt the theories to Greece. For the neo-corporatism framework, the authors outline how the fragmented nature of interest mediation leads to “a climate of antagonism and mistrust” (36) among labor unions and employer’s federations, leading to a risk-adverse climate favoring the status quo rather than a system of reform. The varieties of capitalism framework describes Greece as a mixed market economy where unions and employers have difficulty in “sustaining autonomous coordination in collective bargaining” but have the ability to veto reform (40). The inability of unions, employers, and the government to bargain effectively reduces the opportunity for large-scale reforms to take hold. Lastly, using the welfare regimes framework, Featherstone and Papadimitriou suggest that Greece emulates a Mediterranean welfare state, a welfare state marked by “incomplete coverage and a highly fragmented pattern of income maintenance, with peaks of generosity and major gaps in provision” (42). Interest groups that benefit from the status quo veto attempts at reform resulting in a welfare state that is “expensive, wasteful, and socially exclusive” (43). Featherstone and Papadimitriou conclude the chapter by providing a conceptual synthesis of the three frameworks to “better identify the constraints on Greek domestic reforms” (32). The authors argue the absence of a market oriented populace seeking reform and the privileged position of a few large private corporations leads to “the key social partners defend[i[ing] sub-optimal status quo, fearing the risks of more open competition and the consequences of low state welfare provision” (44). Therefore, the authors conclude that “a stop-go, incremental departure from the status quo is the most likely outcome of domestic reform initiatives” (44). In chapter four, Vassilis Monastiriotis and Andreas Antoniades continue the theoretical discussion of Greek reform failure but narrow their focus to the ‘technology of reform’. The authors argue that reform is lacking in Greece because of “the limited role of experts in informing policy-design and the poor context of many reform proposals” (48). The problem is not the number of experts available for consultation or the ability of think tanks and public or non-governmental policy institutions to contextualize knowledge (the supply side of knowledge creation) but “deficient demand for policy advice” (62) by policymakers, a situation they term ‘engagement deficiency’. Monastiriotis and Antoniades explain ‘engagement deficiency’ in two ways. First, policymakers “have pre-established agendas and do not engage in a systematic way with expert advice, independent or commissioned” (48). Policymakers place their own opinions and preferences above “the experts at all levels of opinion-formation, contextualization, and even of evidence collection itself” (63). The second explanation for the ‘engagement deficiency’ is that the policies pursued are often inconsistent with expert advice, even when experts are consulted. The authors explain this disconnect by noting that experts are often closely aligned with specific political parties. This leads to two problems when pursuing reform. The first is that experts not aligned with the political party in power are discounted, even if their ideas are valid. Second, the politicization of experts means that “it is only a relatively small elite of experts that participate in reform debates” (62). The authors conclude that if the ‘engagement deficiency’ is not addressed, Greek policymakers will continue to pursue a limited reform agenda. Chapter five provides the book’s final theoretical approach to explaining reform failure in Greece. The author, Haridimos Tsoukas, argues for “an enactive approach towards the study of reforms” (85) because “merely explain[i[ing]eform episodes retroactively is not sufficient” (67). The author notes that in a practical world, enacting reform is “more important than explaining reform outcomes” (67). Tsoukas divides the chapter into three sections. The first section outlines the advantages of the enactive approach when compared to other theories explaining reform failure. The primary advantage of his approach is that it provides “actionable knowledge” that can be applied by policymakers. The second section sketches the enactive theoretical framework. Reform is “a complex process of change that includes three levels: policy reform…organizational transformation… and problem-solving” (86). Viewing reform as a process involving multiple levels of integration among different actors allows reformers to “capture the nuances of the reform process” (89) and “see what is at stake at each level and how a possible alignment or interaction between them is achieved” (86). In the last section, Tsoukas outlines how the enactive framework may inform future research of policy reform. These contributions include making it possible to empirically study recursivity, examine how external constraints translate into “triggers for change” (87), and allows researchers “to see reform in its full complexity by looking at the different levels of change and how they interact over time” (88). Chapters six through eleven describe case studies of reform in the policy areas of the economy, education, pensions, health care, foreign policy, and public administration. Chapter six analyzes economic reform between 1990 and 2008. Nikos Christodoulakis, argues studying the reform of this time period is important for three reasons. The first is that extensive reforms were not common before 1990 because reforms only became attractive to the voting public after the poor economic outcomes of the 1980’s. The second reason is that in the early 1990’s Greece started preparing to join the European and Economic and Monetary Union. Lastly, the two main political powers in Greece held power for roughly the same amount of time “so that the importance of ideological factors can also be assessed” (95). Christodoulakis empirically tests the economic and political determinants of reform and finds four key results. First, economic reforms were slow to develop and those that were enacted coincided with Greece’s desire to join the common currency union of Europe (i.e. the euro). Second, economic growth is a key driver of reform because improved economic conditions ease the pain of reform. Third, governments often lack a concise vision of reform when they initially take power and if the implementation of reforms is time costly, reform efforts are likely to be abandoned. Lastly, conservative governments are no more likely to successfully increase reform capacity than left leaning governments. In the end the author concludes that economic reforms were fiercely contested socially and politically. Chapter seven examines pension reform in Greece, both in how a lack of pension reform pushed Greece towards financial distress and “the dynamics of the 2010 reform” (118).The author, Platon Tinios notes that before the 2010 crisis, the Greek pension system was struggling for five reasons. First, the pension system was costly, absorbing more than 12 percent of GDP by 2007. Second, demographics were worsening as the Greek population aged. Third, cross-subsidization within the system led to costly inefficiencies. Fourth, the pension system was poorly targeted. Lastly, powerful interest groups who benefitted from the status quo resisted changes, locking in inefficiencies and making reform more costly. Tinios argues the Greek pension system suffered from syncopated reform “best understood as a piecemeal and interrupted attempt to implement and complete an original blueprint for the pension system formulated in the 1930s” (118). While the 1934 pension law was designed to consolidate the existing pensions into one unified system covering the entire population, by 1997 the number of separate social insurance funds was numbered at 325. As the system increasingly strained the state budget, calls for large-scale reform were usually rebuffed by interest groups and only small-scale changes were passed. These small scale changes were only large enough to kick the proverbial reform can down the road rather than ensure the stability of the system. The 2010 crisis forced outside intervention into the Greek economy as the troika demanded pension reform as a condition of financial help. Tinios concludes the chapter by asking whether the new reform is finally the conclusive pension reform needed for the system’s stability or if it was just another small step that would have occurred in time. The more sanguine view is that the reform has consolidated the pension system into a more workable system and the increased retirement ages will reduce the long term financial strain. The more pessimistic view highlights that while the expenditure side of the pension system was reformed, the revenue side was unaffected. Tinios concludes that only time will tell as to which view is correct. Chapter eight, written by Manos Matsaganis, provides “a closer examination of the motivations underpinning interest groups’ opposition to reform” (134-135) in the public health sector and emphasizes “how the triumph of individualism and the decline of the ethos of public service” (135) undermines health care reform. Whereas the creation of the National Health Service (ESY) was meant to control costs and increase public confidence in medical care provision, Greek health care costs have steadily risen and public confidence in the system is low. Matsaganis shows the National Health Service, established in 1983, “is costly and unsatisfactory to patients, as well as inefficient and inequitable to society as a whole” though “it does serve one important purpose: it provides secure employment and excellent rewards to many of those who work or do business with it – mainly, but not exclusively, doctors” (147). The author provides three reasons for the poor performance. First, reform plans have been “poorly designed and haphazardly implemented” (147). Second, interest groups benefiting from the system resist change, sometimes violently. Lastly, and for the author the primary reason for the health system’s failure, a moral crisis exists among those employed in the public health sector that encourages a system of complacency and individualism. Chapter nine provides “an analytical overview of the education policy of the Greek state” (151). In his analysis, Apostolis Dimitropoulos, distinguishes between distributive and regulatory educational policies. Distributive policies “involve the expansion of the education system and its structures” while regulatory policies “involve the organizational characteristics of the education system, its mode of management, administration, and regulation as well as its functional organization” (151). Dimitropoulos compares the two types of policies because it “allows for a better highlighting of the power relations, the role of the state and non-state actors in the development of educational policy, and the evolution of the Greek educational system since the democratic transition” (151-152). Much like the decline in service and the escalating costs of the public health sector, the Greek education sector has suffered from the same malaise. While the initial reform movement post-1974 was relatively successful, Dimitropoulos credits this success to the limited influence of teachers’ associations. However, the increasing influence of teachers’ associations within the two main political parties has slowed reform. While distributive educational policies (aided by EU funding) were adopted without much opposition, regulatory educational policies have been resisted. Dimitropoulos notes that “as a result, key features of the education system, and particularly its centralized administration, bureaucratic organization and management have remained unchanged, with weak accountability and quality control mechanisms” (167). Chapter ten argues that the Greek public administration has failed to modernize despite the large number or reforms introduced since the adoption of democracy in 1974. In her analysis, Spanou notes “that reform initiatives taken during the past thirty-five years have mainly attempted to achieve institutional modernization rather than performance modernization” (173). This has resulted in a situation where “Inefficiencies have been exposed because Greek public administration meets neither domestic expectations nor EU membership requirements. The profusion of reformist rhetoric exceeds visible reform results” (171). Spanou presents two main reasons for the lack of practical administrative reform. First, administrative reform policies remain legalistic rather than technocratic. Second, the civil service has been politicized, where “civil servants represent a kind of ‘clientele’ for the governing party” (188). The politicization of the bureaucracy has also lead to political parties nominating individuals for top bureaucratic management posts based on political connections rather than merit. The bureaucracy has responded to this politicization by becoming increasing introverted and resistant to reform. The last case study chapter (chapter eleven) explains the major shift in Greek foreign policy in the late 1990’s, particularly how Greece deals with its Balkan neighbors, specifically Turkey. For the past few decades, the Greek government considered Turkey its largest external threat. However, in December 1999, Turkey became a conditional member of the EU after Greece lifted its long-lasting veto. Panayotis Tsakonas outlines the shift in Greece’s behavior towards Turkey and notes that the Greek government wanted to “employ the EU as a means of better balancing Turkey, and also turning the EU into a catalyst for the resolution of the Greek-Turkish conflict” (205). Greek policymakers reasoned that if Turkey was integrated into the norms of the EU, Turkey would be forced to adopt “European-style ‘rules of the game’ where Greece “could also exercise a certain amount of control over Turkey’s ‘conditional engagement’…by putting Turkey under the constant screening and monitoring process” of the EU” (204). In the end, Tsakonas argues that Greece was able to leverage Turkey’s desire to join the EU into successful Greek reform story. The book’s last two chapters consider how the 2010 economic crisis can be incorporated into the preceding analysis of reform change. Chapter twelve documents how the 2010 economic crisis unfolded, the government’s response to the crisis, and explains the measures the Greek government must implement in order for the government to access bailout funds (i.e. the Memorandum). The decades’ long failure of adopting meaningful economy wide reform hastened the fiscal crisis of 2010. Only when the financial crisis invited external actors (the troika) to intervene in Greece was a substantial reform agenda formulated and implemented. As noted by the authors, the hope is that “the groups that traditionally oppose reforms and take the political system hostage when they want to secure their rents, and which are the main obstacles to improved governance, will fade away” (245). Chapter thirteen examines the limits of the externally imposed conditionality on domestic reform. The 2010 financial crisis pushed talk of reform into actionable steps of reform and gave reform proponents greater leverage. As noted in chapter two, the Greek executive branch should be able to enact legislation because of the Greek politico-institutional structure. The 2010 crisis empowered the executive branch to pursue reform. From Stagnation to Forced Adjustment provides a scholarly and systematic treatment of Greek reform since its transition from authoritative rule to democracy. The book balances well the theoretical treatments of reform with case studies that elucidate the theoretical literature. The book’s three distinct sections allow readers with different end objectives to find value in the book. Scholars interested in how reform theory can be applied to Greece, but who are not concerned with individual case studies, can focus on chapters two through five. Researchers and policymakers concerned in how practical reform has been stagnated in Greece will find chapters six through eleven valuable. The individual chapters of section two are also self-contained, so for example, researchers and policymakers evaluating Greek pension reform can concentrate on chapter seven. For those who want to understand the 2010 fiscal crisis and the Greek response, chapters twelve and thirteen are a must. Finally, the book may be of interest to those seeking a multi-decade explanation of why reform was difficult to implement. Additionally, while the book focuses on Greece, the lessons learned could be applied more widely, particularly to countries who also have struggled implementing reform. As a whole, the book has two general weaknesses. First, since each chapter is self-contained, the book is a choppy read which lacks transitions between the chapters. While the introduction does an admirable job of synthesizing each chapter into the larger hypothesis of why reform implementation has been historically difficult in Greece, it provides a winding roadmap, explaining the case studies before the theory even though the book provides the theory before the case studies. Also, the theory chapters fail to complement each other and at times provide such starkly different interpretations of reform failure in Greece that the reader is slightly bewildered. Even worse, the case study chapters do not naturally flow from one policy area to another and the last two chapters feel forced rather than a concluding postscript. However, this is a minor weakness and a simple rearrangement of the chapters would reduce the awkward transitions. The second weakness of the book is the authors’ presumption that readers have previous knowledge of the Greek political system, which may be a large barrier to overcome for many readers, limiting the book’s effectiveness. This is most acutely seen in chapter 10 as only the most specialized readers will know in advance how the bureaucratic structure of Greece operates, yet that information is very helpful, though not strictly necessary, to understand the detailed presentation of bureaucratic reform. The weakest of the book’s chapters is Manos Matsaganis’ analysis of the Greek public health system. Matsaganis blames the failure of the public health system on the individual actors themselves (the author saves special venom for doctors) rather than the incentives the system creates. Matsaganis’ suggestion to fix the public health system, identifying and supporting “doctors and other workers who are still willing to offer their services to ESY, in exchange for no more than a decent salary, the respect of their peers, and the gratitude of their patients” (147) is simplistic and unrealistic. Changing the actors without changing the system’s incentives will lead to an outcome where the new actors will act precisely like the previous actors. Additionally, if, as the author argues, there is a lack of public support for publicly provided healthcare, instead of doubling down and continuing to force the provision of the service, the author may find it wiser to reform the system through market oriented solutions. From Stagnation to Forced Adjustment is a timely book that provides a comprehensive overview of the reform process of Greece since it emerged from dictatorship in 1974. While the book’s scholarly tone probably limits its audience, it is well written and is accessible for any educated layman interested in the Greek experience with reform or how Greece’s failure to reform hastened its fiscal collapse. While the Greece experience will differ from the experience of other countries, careful readers will be able to see similarities between Greece’s experience and other Western countries with questionable fiscal stability and who experience difficulties producing large scale reforms. This book is highly recommended for scholars and policymakers in multiple fields, including economics, international relations, and political science. Jared A. Pincin is an Assistant Professor of Economics at The King’s College in New York City, where he teaches Economic Development and Economic Policy. His email is jpincin@tkc.edu. [1a> A third possible option for Greece was the reintroduction of the drachma as the official currency (essentially currency devaluation). However, such a move is problematic for a variety of reasons, not the least of which is that Greece’s debt is denominated in euros, not drachmas. Jared A. Pincin is an Assistant Professor of Economics at The King’s College in New York City, where he teaches Economic Development. His email is jpincin@tkc.edu.